So, you want to buy some 'MpS', eh? You've come to the right blog. You see, for the past four years, I have been selling Mps. For the past 2 years, I have been the Practice Manager at a small MpS practice - I was in charge of the entire infrastructure. Building it, pulling it out of the fire and evangelizing MpS to prospects, co-workers and executive management. I have built partnerships throughout the MpS/Imaging Ecosystem. I know every MpS sales technique, every hook, every mirror and all the smoke. I've sat in on more MpS training classes than most anyone and reviewed almost every, single OeM MpS program as well as all the independent creations. Over the past 24 years, I have formed passionate opinions about MpS, sales, and technology. My views and opinions have made many inside the industry uneasy. I am an Agent of Change an Advocate for Transformation. And today, I will expose myself to you. Well, at least a bit of me...the MpS me, not the Leopard Thong Me. But first, determine how much you are currently spending, how many output devices you utilize and how much you are spending per month on lease, toner, service and supplies. 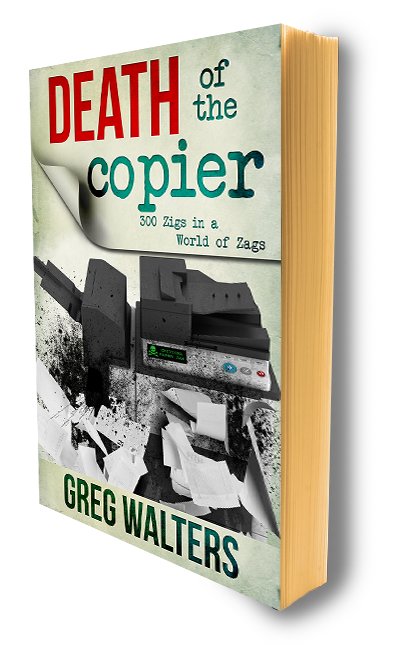 Look at ALL your devices, copiers, single function laser and multi-function devices. Find all the hidden toner in your organization and get a cost associated with that toner. Determine and document your internal toner/supplies support processes. How are supplies ordered? Who performs your service? When a printer breaks, who calls who? How is toner ordered? Next, take a look at the basic workflow in your accounting department and recognize the value of documents. After you complete these simple tasks, define 'managed print services' for yourself. Now, go ahead and give your local MpS company a call and invite them in for a chat. 12. What is Managed Print Services? 11. How do you bill? 10. How do you collect meter reads? 9. How do you deliver toner? 8. How long is your engagement? 7. Do you have cancellation clause? 6. What procedure do you have for adds and drops? 5. What is your service SLA? 4. Do you provide OEM or third party toner? 3. Do you have overage charges? 2. What other services do you provide beyond toner and service? 1. How many people in your organization support the MpS programs? Not all that remarkable, eh? If you, as a customer/prospective MpS user, can get these questions out on the table, and get a response or two from your provider, you'll have a decent picture of how your MpS program will roll out.